Packaged mineral water or drinking water plants involve the processing of raw or contaminated water to be treated with proper mineral additives and pass through purification stages to be safe for human consumption. 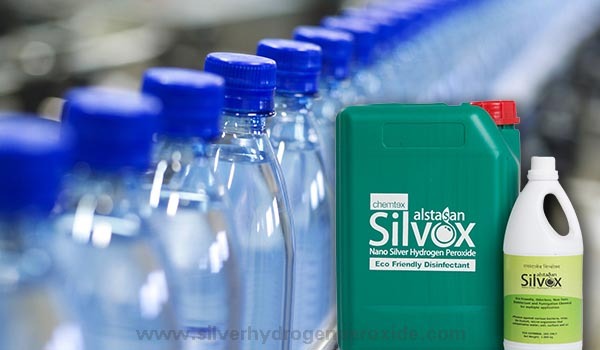 ALSTASAN SILVOX (Silver Hydrogen Peroxide based Biodegradable Water Disinfectant) manifests to be efficient in addressing the following areas of concern involved in the processing of packaged drinking water without leaving behind any harmful/toxic effects. This potent biocide is diluted at a given concentration and fumigated using a fogging machine to sanitize an area involved with the processing of packaged drinking water. Some common airborne microbes that may contaminate the water are Bacillus sp., Varicella sp., Influenza virus, Variola virus, Rubeola virus, etc. Disinfection of drinking water is ensured properly with Alstasan Silvox. A hassle free process of adding this product at a recommended dose to water renders it safe for use. Some common waterborne microbes include Entamoeba sp., Vibrio sp., Giardia sp. etc.